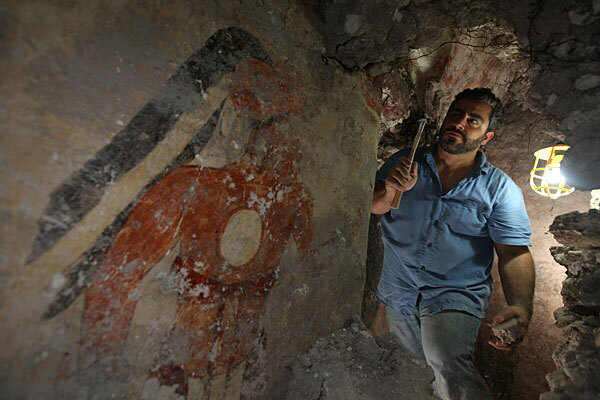 Caption information by National Geographic: "Younger Brother Obsidian," as labeled on the north wall of the Maya city's house by an unknown hand, was painted in the 9th century A.D. Archaeologist William Saturno of Boston University excavates the house in the ruins of the Maya city of Xultún. Younger Brother Obsidian may have been the town scribe. Excavation and preservation of the site were supported by the National Geographic Society. Photo by Tyrone Turner © 2012 National Geographic.